Latham-Russell Mark Fryer, age 89, died peacefully at Van Rensselaer Manor on August 5, 2018. He was born in Albany, NY but resided in Rensselaer for most of his life at which time he joined the military at age 17. He was the son of the late Willard and Ella Fryer. 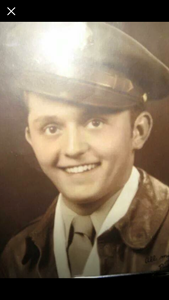 Russell was a US Army Air Corps and US Air Force Veteran from October 22, 1945 through August 21, 1952 serving during WWII where he was awarded a Victory Medal, he also served in Korea. He served as Staff Sgt and Crypto Analyst. He held many jobs throughout his life. He was most proud of his Military service, working as an Allstate Agent while living in California. Later he worked as a Weaver at Albany Felt and Huyck Felt. He also worked in R & D and was a Loom Mechanic for C.M. Offray for 17 years, retiring in 1999. While at C.M. Offray he developed a grounding ribbon for which he received a patent and sold it for $1.00 to his employer. Russell had a passion for cars, and one of his hobbies was keeping his cars Immaculate. He enjoyed watching Me TV and watched every episode of M*A*S*H several times. He also enjoyed watching Notre Dame football but most of all his baseball team the NY Mets. In his advanced years he enjoyed tinkering with whatever he could get his hands on and his remote control truck. He is survived by his beloved wife of 36 years, Maria, his children: Steven (Francine) Fryer, Rick(Debra) Fryer and Brian Fryer; his step children: Joao E. Pestana of SC, Emanuel(Gladys) Pestana of CA, Luis(Maya) Pestana of NY and Maria(Frank) Prudhomme of NY; his nephew Robert(Robin) Fryer of NY; adopted brother Daniel Miller; several grandchildren and great grandchildren. He was predeceased by his step son Alexandre Pestana, his brother Robert(Helen) Fryer, and his sister Geraldine Peters. Private graveside services will be held at Saratoga National Cemetery at a later date. Memorial contributions in Russell's memory may be made to the Alzheimer's Association, 4 Pine West Plaza #405, Albany, NY 12205. Add your memories to the guest book of Russell Fryer. I worked with Russ and Maria at CM Offray many years ago. Russ was always happy go lucky and loved life with a big heart. Russell was a great man with a wonderful sense of humor. He will be missed cruising the hallways in his funny hats and his remote control truck. I'll never forget all the great stories Russ shared with me. He was always good for a bright smile and hearty handshake. See you in the next life. To my family - I'm praying we find strength, peace and comfort during this difficult time. I love you all.